You are here: Home / Blog / Blog / Are Bifold Doors Still Popular in 2018? Are Bifold Doors Still Popular in 2018? Are bifold doors still on trend? Well you’ll be happy to know that they’re still as popular as ever among homeowners in the UK. From our own experience here at Lite Haus UK, we can say that the demand for bifolding doors has surged across the West Midlands and interest is continuing to grow. Still unsure? We understand that bifold doors are a big financial investment for anyone. That’s why we’ve asked our customers for their view on bifold doors and how they have benefited their home. Add financial value to your home: With bifolds being sleek and slim, it makes them very aesthetically pleasing. It’s likely that home buyers will be immediately drawn to these types of doors and show greater interest in your house. Security: It’s commonly known that burglars will target the back of a property. But you will be relieved to hear that bifolds offer a number of security features. The aluminum material makes them extremely strong and durable and the doors are fitted with multi-point locking systems for added security. Energy efficient: Another added bonus is the thermal insulating properties of these types of doors. The glass is specially designed so that in the summer your home will stay cool and in the winter heat can be contained. Variety of sizes: Bifold doors aren’t just exclusively for large doorways. They actually come in a variety of sizes, from 2 panes all the way to 7. Both big and small spaces can have their look transformed with these versatile doors. Bring back your view: Ever wish you could see your beautiful garden or the fields behind you. Instead of a plain door, obstructing your view? Bifolds will give you the freedom to do just that and also let natural light flood in, bringing your room to life. Low maintenance: They’re incredibly easy to maintain, you only need to clean the tracks and windows once in a while. The aluminium material of the bifolds does the job for you, it is designed to be durable and deal with the worst weather. What are possible alternatives to bifold doors? Like a lot of people you’re probably considering all of your options for your home. Sliding patio doors are another popular choice that home owners look at, due to their practicality and style. If you’re still weighing up your choices, you may find our comparison guide of bifold and sliding doors useful. 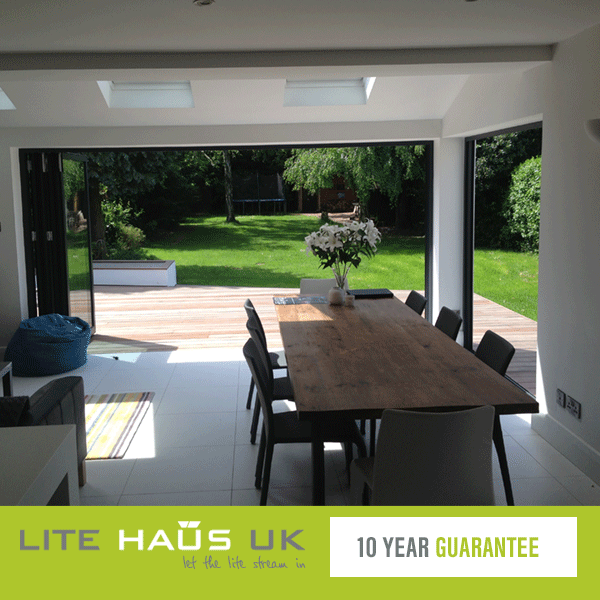 Lite Haus UK is one of the leading bifold suppliers and fitters in the West Midlands, including Leamington Spa, Solihull and Rugby. Completing bespoke home projects is nothing new to us, after being in the business for many years we’ve seen all sorts of unique builds. The most important thing we treasure is after-care, ensuring that our customers have peace of mind that we will return to them if they have any problems. That’s why we keep our reach to a smaller local radius, so that we’re right around the corner if you need assistance. Also, all of our bi-folding door products come with a 10 year guarantee!